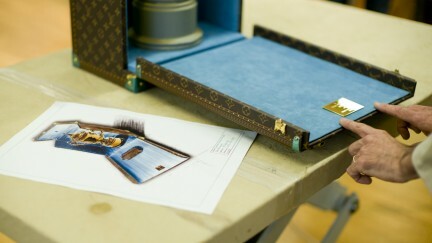 Photography courtesy of Louis Vuitton/Paul Warchol. 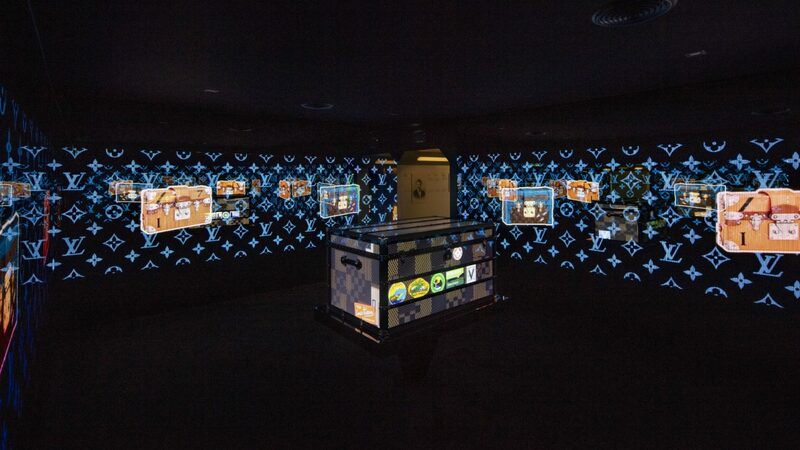 Louis Vuitton has returned to where it all started: a place of departure. By hosting its “Time Capsule” exhibition at the entrance to Toronto’s Union Station, the luxury house takes viewers on a sentimental journey through its 160-year history that is rooted in travel and craftsmanship. 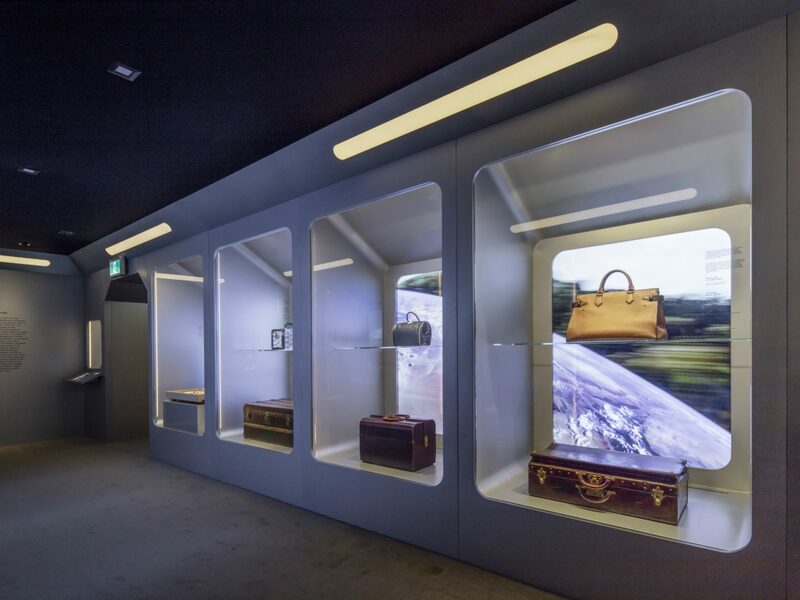 Timed to coincide with the 35th anniversary of Louis Vuitton’s arrival in Toronto, “Time Capsule” demonstrates how the brand has continuously excelled at marrying consumer needs with technological innovations. The free exhibition, on display until September 30, 2018, features six installation rooms, each with its own theme. 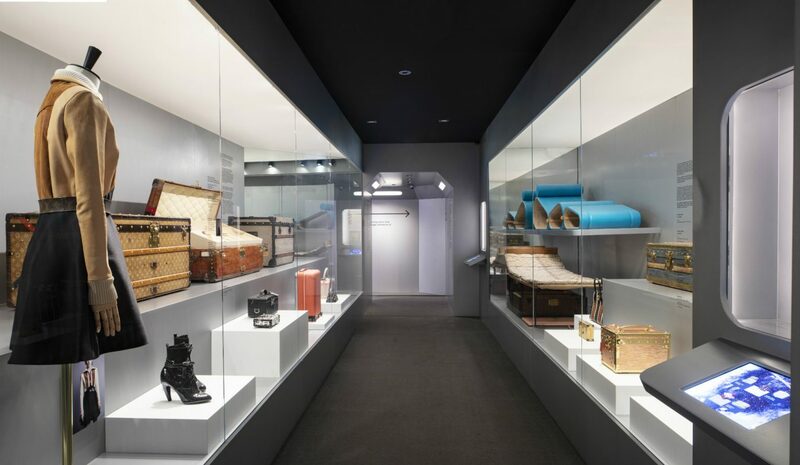 It begins with the Artisans Room, where guests can observe a Louis Vuitton craftsperson working away on various objects, from luggage tags to Petite Malle bags, using an array of the maison’s famous leathers including Epi, Taïga, and Utah. 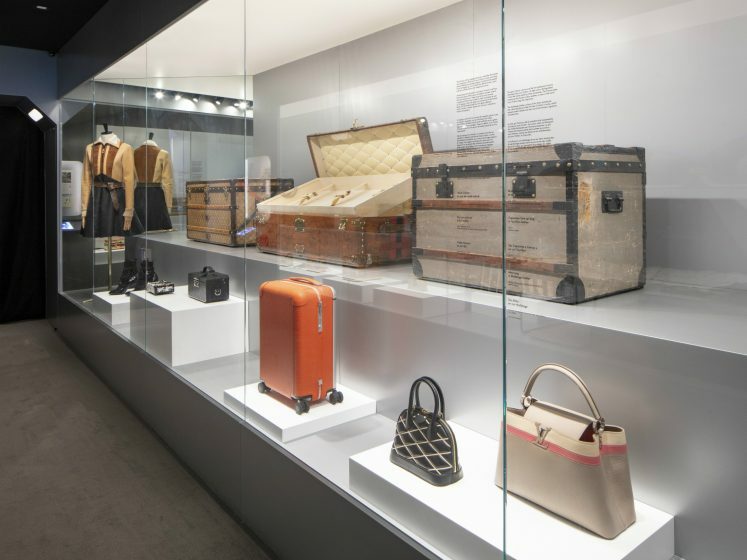 Next, visitors find themselves in front of The Key To the Codes display that showcases the evolution of the main Louis Vuitton design components: the hardware, the materials, the patterns, and the Malletage that lines the trunks and bags. Move then to Journeys Around the World, which presents a timeline of important moments in the brand’s history by placing antique objects against their contemporary versions. For example, the ingenious collapsible sleeper trunk in striped canvas from 1878 is juxtaposed against a plush leather lounge chair by Marcel Wanders from the 2016 Objects Nomades collection. 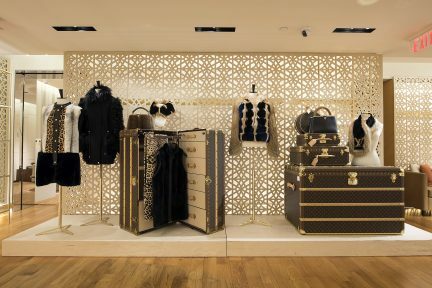 Similarly, the sturdy 1888 zinc trunk is displayed next to the Fall/Winter 2014 Petite Malle prototype in gilded metal by Louis Vuitton women’s creative director Nicolas Ghesquière. 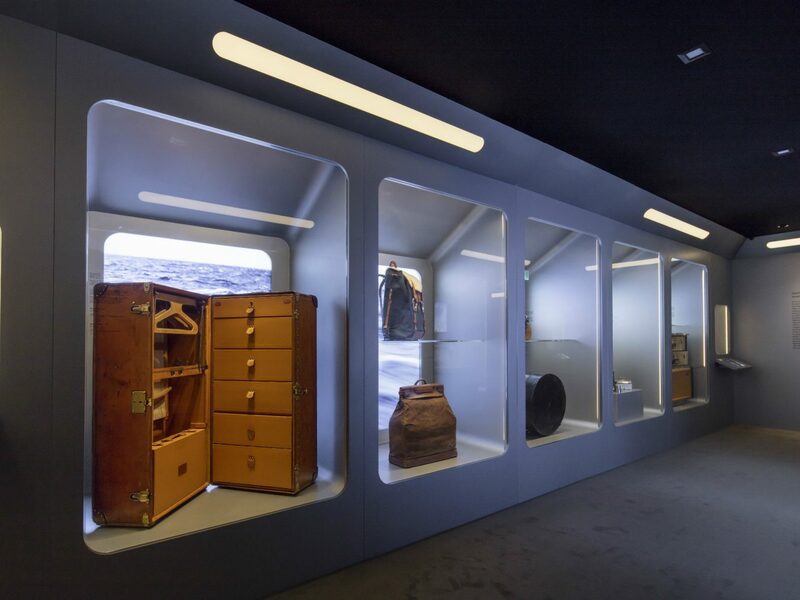 This part of the exhibition also pinpoints the societal shift from train travel to car travel by displaying one of the first trunks designed in 1926 to fit in vehicle storage. Perhaps the most spectacular part of this section, though, is the wardrobe trunk circa 1928: a superbly crafted leather piece, complete with hangers and drawers, designed for long-term ship travels. Another notable moment is the reveal of how the simple laundry steamer bag from 1901 inspired a Fall/Winter 2013 backpack designed by former men’s creative director Kim Jones. Among the most charming items on show is a picnic trunk from 1909 that is complete with metal, ceramic, and glass tableware. 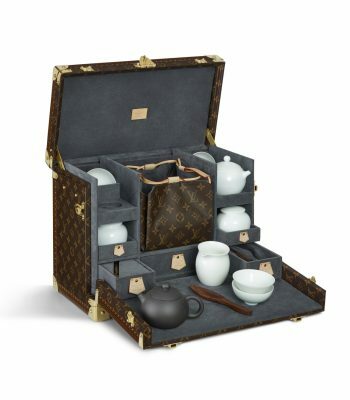 Elegance in Motion follows, looking at Louis Vuitton’s ingenious storage of precious objects during travel. There is a toiletry set from 1914, and a Vanity Train case in Épi leather circa 1970 that once belonged to the legendary actor Lauren Bacall. The house’s contemporary Rose Des Vents and Sur La Route fragrances are displayed next to a leather travel case from 2017, contrasted on the opposite wall by a monogrammed canvas cassette box with 10 tapes perfectly nestled inside of it. And although new, a portable record player box in monogram Macassar canvas from Jones’s Fall/Winter 2017 collection feels nostalgic in its own right. 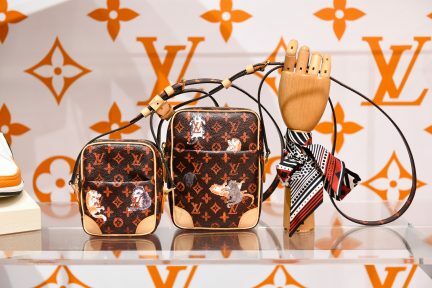 The luxury house is known for its collaborations, and these famous partnerships get their moment in a section called Louis Vuitton and the Arts. In fact, some of the brand’s earliest trunks were inspired by artists such as soprano Marthe Chenal and conductor Leopold Stokowski. 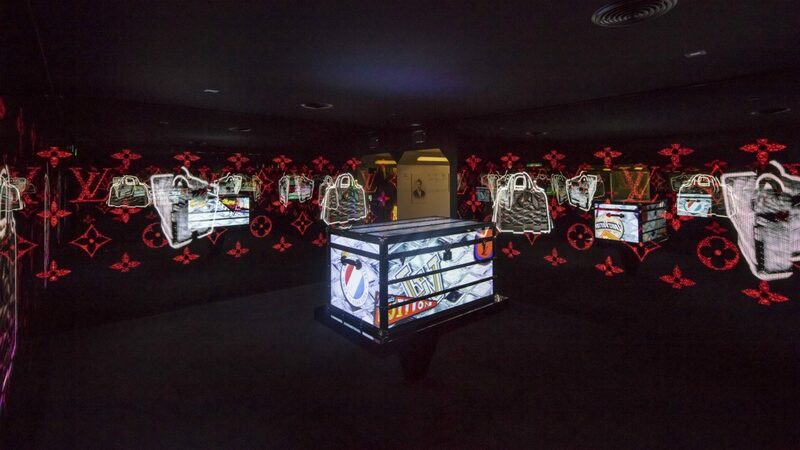 The exhibition features four iconic Keepall bags, including former creative director Marc Jacobs’s collaboration with graffiti artist Stephen Sprouse from 2001 and Takashi Murakami from 2008, along with the much-hyped Supreme collection. Three Speedys are also featured in the room, including last year’s Leonardo Da Vinci and J.M.W. Turner bags by Jeff Koons. Lesser known but still spectacular joint ventures include a coated canvas shoe travel bag from 1996 by Manolo Blahnik and a Twisted Malle bag from 2014 by Canadian architect Frank Gehry. 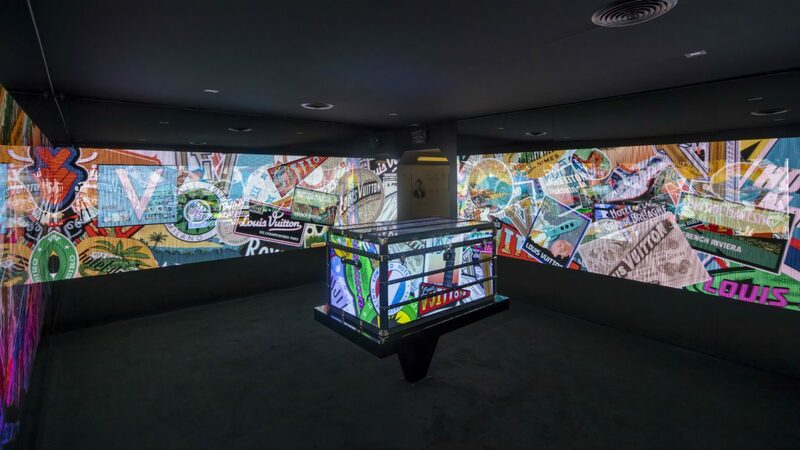 “Time Capsule” concludes with an immersive multi-media experience that once again leads the viewer through the history of the legendary maison, from the first-ever trunk and the many iterations of the famous coated canvas to the opening of Foundation Louis Vuitton. What a journey it has been.